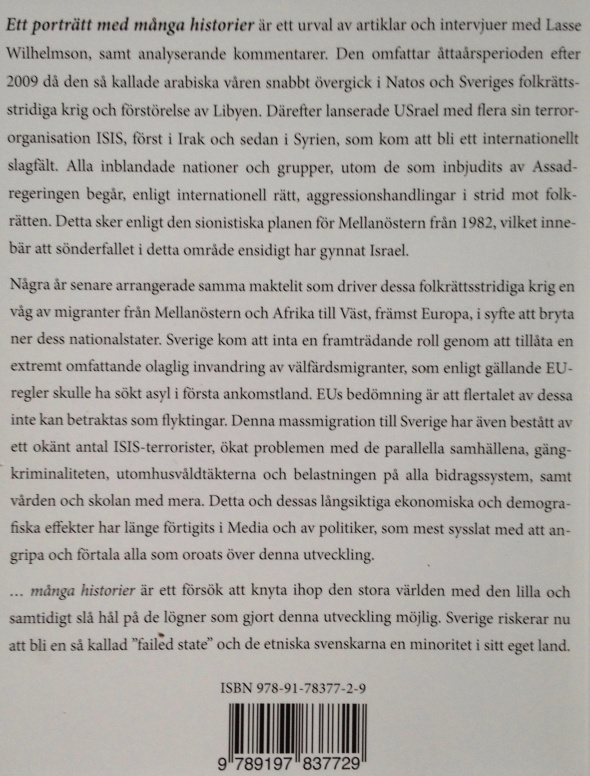 Introduction by Gilad Atzmon: For some time, Swedish Palestinian female TV presenter Gina Dirawi has been chased by Sweden’s Zionist protagonists within the media. Dirawi has been outspoken about Israeli crimes and Palestinian rights. But recently when she referred to Lasse Wilhelmsons book ‘Is The World Upside down?’, hell broke loose. Wilhelmson is critical of the Jewish state, Zionism and Jewish power. Wilhelmson was one of the first thinkers who pointed at clear ideological and spiritual affiliation between Zionism and the Left, a theme I myself developed in my work. 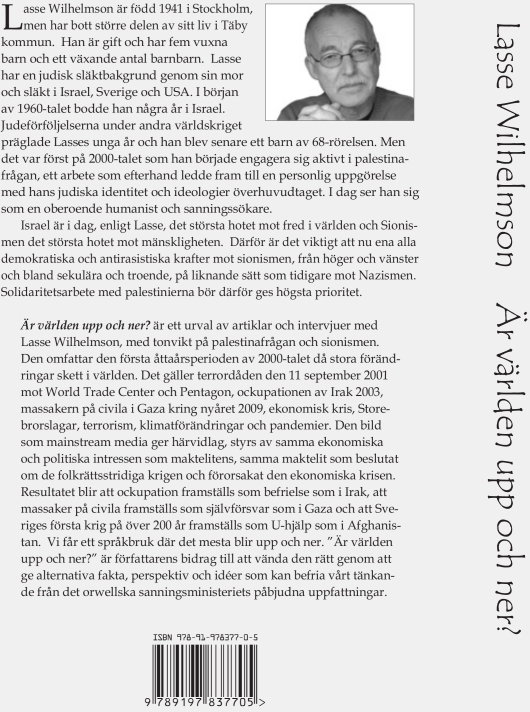 The Swedish media would prefer to keep Wilhelmson in the fringe. The Swedish tabloid Aftonbladet now seems to want him in jail. What we see here is an outrageous and unacceptable assault on freedom of expression. The following are two of Lasse’s answers to his detractors. Reading through the article, which incidentally does not include one single quote from my book Is the World Upside Down?, I ask myself, why would you do that? After all, you’re an educated person, an intellectual, a significant representative of the Swedish cultural elite. You have written a prizewinning book about your childhood, you’re an influential voice of the Swedish left and you have presented yourself as a ”free speech fundamentalist”. 1. Do you consider that what happened to the Jews during the Second World War as a historic event that can be legitimately researched, discussed and revised as we do with other historic events? If the answer is no then my next question is: Why? If the answer is yes, the question is: In that case, why is it that, in so many western countries, so many who have done so, have been sentenced to prison? 2. Do you know of any other historic events in our time where people have been imprisoned for having an opinion that differs from the norm? 3. Do you think opinions should be punishable? Accusations of hating a whole population carries with them, I think, a considerable burden of proof. You have produced none. Asa, I do not hate people, only deeds and ideas, and above all, hypocrisy. But perhaps it is you who hates people who do not share your views – for example, me. You say that I believe that Israel should be obliterated, though I have never expressed myself in that way. I could say that you are lying, but I prefer to think you are simply deluded.. In my lifetime, I have appeared many times in the media and I have always been given the chance to defend myself when attacked – except that is, when the questions concern Zionism and its short-term goal of a Jewish state in Palestine. Why is this? Could it be that what I have to say is dangerous – perhaps just a little too close to the truth? Why do you behave in the manner of witch hunts and book burnings when I am simply trying to understand how the world works and which forces lie behind war and misery? My book includes much about this, complete with notes and references. Over time, I have indeed come to embrace views other than your comfy ”leftist” ones. Nowadays, I think ideologies and religions have both light and dark sides – sometimes they are used to liberate people, sometimes to persecute. But, above all, I believe that in order to set ourselves and others free, our thinking must be liberated from the prohibition of forbidden thoughts and from limited thought systems. You’ve probably also read about my personal background and how my thinking has changed and why. You will know that, in my very full life, I have achieved quite a lot as an activist in the left movement, for the people of Vietnam, as a trade unionist, as a member of one of the contemporary Communist parties and also in many other non-profit organisations. Why, it could it be that I am even more versed in Marxism and its classical texts than even you are? In my home municipality of Täby, I have taken part in local politics for 24 years, working on very real issues there and in the surrounding region. I was a member of the district council and, at one point, I was on the board. I am currently the chairperson of a road committee in the countryside and have just written its Jubilee brochure, with many stories about how an old Swedish farming community has changed over a century. I have always been a public person and have never hidden behind anonymity. Many know me, or have heard of me, in various contexts. I have five children and many grandchildren and I am married. Have you thought about how your, and the rest of the media’s attempts to make me an object of hate will affect them all? Perhaps that might give you pause for thought? This is why the Sweden Democrats, the most Israel-friendly party in our parliament, have the same fundamental attitude as most of the ”left” that claim to support the Palestinians: that the Jewish state is permanent and that the exiled Palestinians can never, as UN resolutions say they must, return home in any way other than symbolically.They must content themselves with a pseudo-state of 10-20 percent of the original Palestine (the two-state solution) – a situation which can lead to neither justice nor peace between the Mediterranean Sea and the Jordan River, nor in the whole of the Middle East and beyond. Because Zionism (or rather now, post-Zionism), has the whole world as its goal. It is the most significant expression of Anglo-American imperialism and its criminal wars and, to achieve its new world order, its power elite controls the making of ideologies (media) and central banking (the dollar). Åsa, you don’t have to freak out just because someone suggests that your lifelong right/left map does not actually reflect reality. Such behavior gives the impression that the left that you so personify, is really completely and utterly anti-intellectual. The above-mentioned article (1), published on November 23rd, 2012, and which has been widely distributed throughout the media, is an assault on Gina Dirawi, a young TV presenter of Palestinian origin. It is no secret that Expo (Swedish Searchlight) dislikes Gina Dirawi, and any other Palestinians, who occasionally express dismay that their homeland has been stolen and many of its citizens exiled. Expo never criticises the racist nature of the Jewish state and its genocidal policies (see UN Convention) vis a vis the Palestinians, but rather launches witch-hunts against those that do. The book referred to as ‘anti-Semitic’ is mine. It is “Is the World Upside Down?” (2009), a selection of articles I wrote and interviews I gave from 2003 to 2009. Several articles are co-written with others. The book is about Palestine, the neocolonial wars and Zionism (2), and also contains a re-evaluation of certain ”truths” about twentieth century history as imposed by the victors of both the Russian Revolution and the two World Wars. The book can also be understood as a personal journey – an attempt to assume a humanitarian approach, independent of ideologies and religions. The campaign against Gina Dirawi is a clear case of guilt by association – a common, but extremely distasteful and unethical, tactic. This campaign uses distorted interpretations and a false taboo-image of the book and its author. A few things to ponder …. Are we to no longer read books that do not comply with our preconceived ideas? Are we to no longer read books to improve our knowledge and even, perhaps, to understand our lives and the world we live in? Are we no longer to read books other than for pure entertainment? Do we need moral gate-keepers to tell us which books we may read? Rather than being openly and freely discussed, are readers and writers to be simply branded? Have we really gone back to book burning? Is it only the elderly among us that remember Arthur Miller’s play The Crucible (1953). Why is it that the media always and routinely publishes Expo’s articles but seldom checks for accuracy, out-of-context facts and quotes, interpretations, value judgments and sources? I can see no humanitarian and righteous solution to the situation in Israel/Palestine except that all exiled Palestinians be permitted to return home and regain their possessions. This is in full accordance with UN resolution 194. Jewish settlers who do not wish to live in equality and harmony with other Palestinians between the Mediterranean Sea and the Jordan River, should return to the countries from which they came. This may seem utopian, but all else leads only to catastrophe – even for the Jews themselves in Israel/Palestine and the surrounding world. I always try to be careful not to blame whole groups when certain members of those groups behave badly or illegally and, as far as I know, I have never done so. Yet it is often precisely this of which I am accused – but only when it comes to Jews. I still wait for some substantial, contextual proof of my transgressions so I can correct or explain myself. I do not hate people, but I do hate double standards – especially hypocrisy – a hypocrisy most blatant when it is about anything to do with Israel/Palestine, Jews and Zionism. Hypocrisy disgusts me as totally incompatible with ethics and morals. It is this which underpins the harsh words I often use in my political articles. For the most part, I criticise the Jewish ”Mafia” who are among the richest and most influential people in the western world, and also all those who serve their cause. I also criticise Jewish lobbies and Jewish settlers. If I speak of ‘Jews’ I do so in the same way I might speak of ‘Palestinians’, ‘Swedes’ or any other group. Obviously, ideologies, religions, mentalities and cultures can be criticised in more general terms. In my opinion, it is no myth but a fact that there is a Jewish Mafia (just as there are Chinese and Italian Mafias) which has a disproportionate influence on the world economy, ideology (media and Hollywood etc) in the western world and on American foreign policy. And this situation is repeated in most European countries. This influence is used, for the most part, quite openly and by many very famous people. It is also true that Jews often put loyalty to the Jewish state before loyalty to the country in which they live. It must be legitimate to discuss all these things openly and freely without witch hunting and book-burnings. Most of what I write, I base on articles found in Israeli newspapers and documents in Jewish libraries, together with books from Jewish professors of history and political scientists. So far, most of the information can still be found on the internet. I believe that Zionists misuse Judaism, similar to the way in which Crusaders misused Christianity, let alone the Wahhabites’ misuse of Islam. I have warned that the international crimes of the Jewish state and the Jewish Mafia could well have a boomerang effect on all Jews if they are not able to distance themselves from it. After all, the Jewish state is proclaimed in the name of all Jews, and all Israel’s wars are waged by weapons bearing Jewish religious symbols. In the Expo article I am quoted: ”There has been animosity against Jews all through history. But it is often induced by the Jews themselves through their behaviour”. What is wrong with that? The same applies to all groups especially any group of people who see themselves as better than other people and particularly, ”God’s chosen people”. But my strongest reaction is reserved for the way Jews have taken upon themselves a monopoly of suffering that overrides the suffering of others and is used to legitimize Israel’s policies and treatment of the Palestinians. Furthermore, rather than history, always subject to discussion and revision, the Holocaust with its capital H, has, I believe, been transformed into a religious taboo dogma, Most outrageous is when it is used for political reasons to start new wars and legitimize genocide against the Palestinians who, we must always remember, had nothing whatsoever to do with any persecution of Jews. As far as the term ”conspiracy theorist” goes, that too is misused for political reasons. There have, and always will be, conspiracies in the corridors of power, and the powerful and their geeks will always call those who try to understand their conspiracies, conspiracy theorists – meaning some kind of sick fantasisers. This is Orwellian doublespeak. There are, indeed, so-called crackpots all over the place – many planted by those in power to create confusion. And finally: I talk and discuss with everyone. My articles are published anywhere. I am always a public person and I wish to debate facts – something that rarely been offered to in the ten years I have been writing about these issues. Free speech, what free speech? If what I have written here and elsewhere means that I am a ”conspiracy theorist”, ”anti-Semite” and ”Holocaust denier”, then so be it. I hope and expect that soon there will be many more of us. 3. Why is the Truth Dangerous? 5. It’s a trick. we always use it.